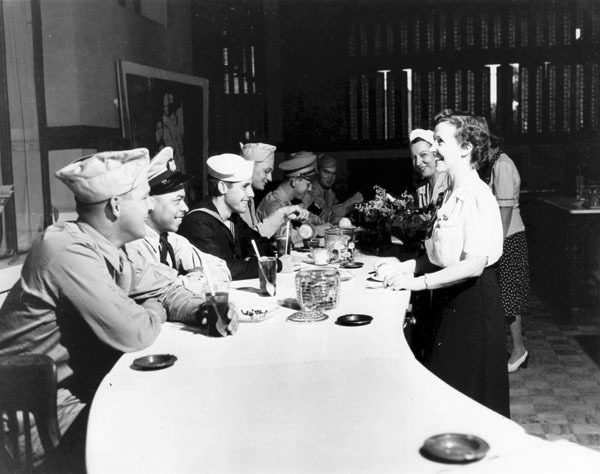 Description: This is a Canteen sponsored by the Soroptomist Club, located in the Union Station, 701 East Douglas. Servicemen were welcomed by the volunteers. Keywords: People, military, business and industry, service counter, restaurant, African American. Description: Building trainers for the Army and Navy at the Stearman Aircraft Division of the Boeing Airplane Company in Wichita. Keywords: Wichita, aviation, business and industry, military. Description: Army Air Force band performs at the Forum during World War II. Located at 231 South Water Street, the Forum served as Wichita's municipal auditorium from 1911 to 1965. Keywords: Wichita, public events, military, arts and entertainment. Description: PT-17 under wing of B-17 at Wichita Municipal Airport. Keywords: Wichita, aviation, military, airports, airplanes. Description: Looking northeast at Butts Motor Company, 1520-24 and 1600 East Douglas. The photograph may have been staged to advertise the sale of cars with special controls to disabled people such as the men with the crutches. During the 1940s the Oldsmobile Company developed the first fully automatic transmission and promoted the “Hydra-Matic” to injured veterans returning from World War II. Each vehicle was equipped with controls determined by an individual’s specific needs. Other businesses in view include The Ferndale Café, Kansas Press, and Orpheum Cleaners. 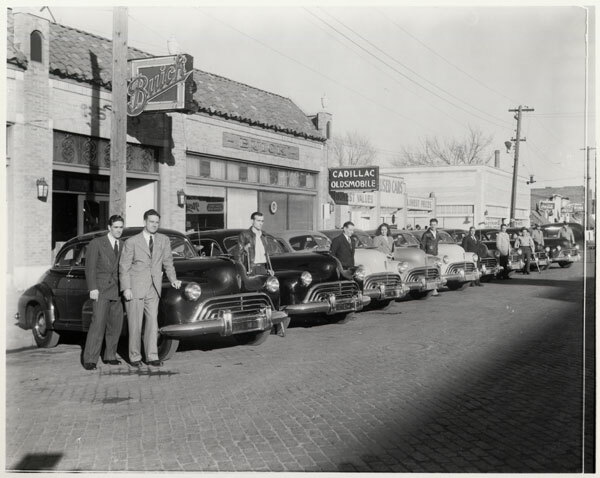 Keywords: Wichita, business and industry, people, street scenes, transportation, automobiles, Cadillac, cars, crutches, military, service men, WW II. 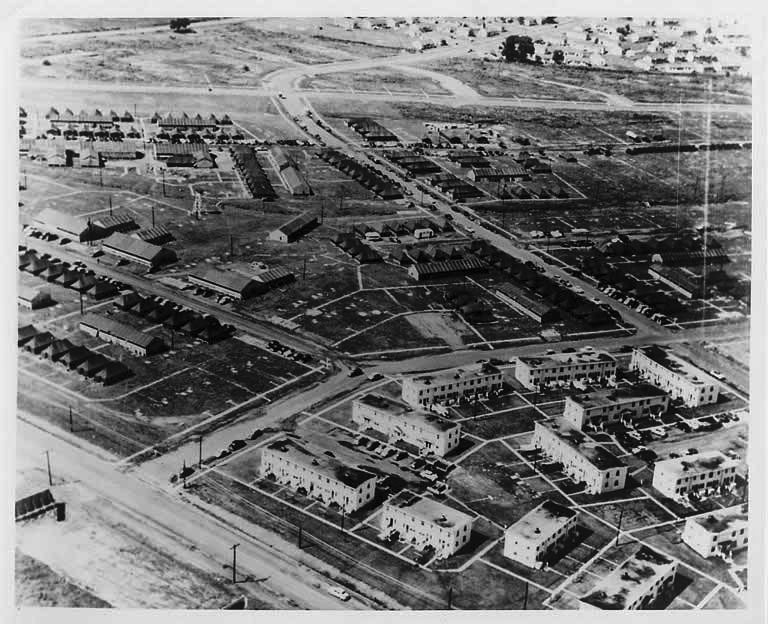 Description: Planeview community (lower right) was built under federal guidelines in 1943 to provide housing for defense workers arriving to find employment in the aircraft companies. Hilltop Manor and Beechwood were similar developments. In 1951, adjacent land belonging to the Municipal Airport was converted into an Air Force Base. 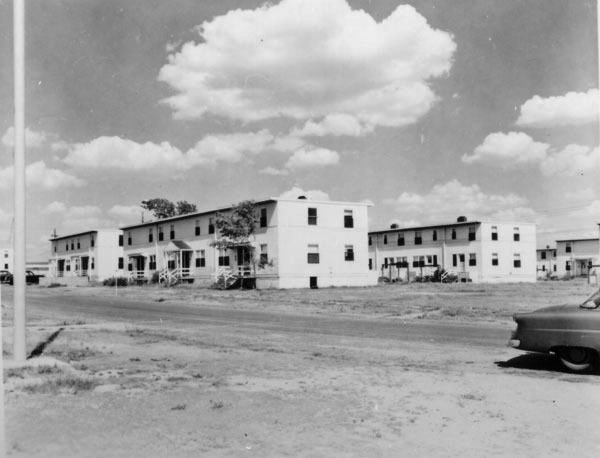 The "tent city" (above left) provided early, temporary housing for Air Force personnel. Keywords: Wichita, aerials, aviation, military, public services, residences, houses, World War II, National Housing Agency. Description: Location, 123-133 North Main Street. 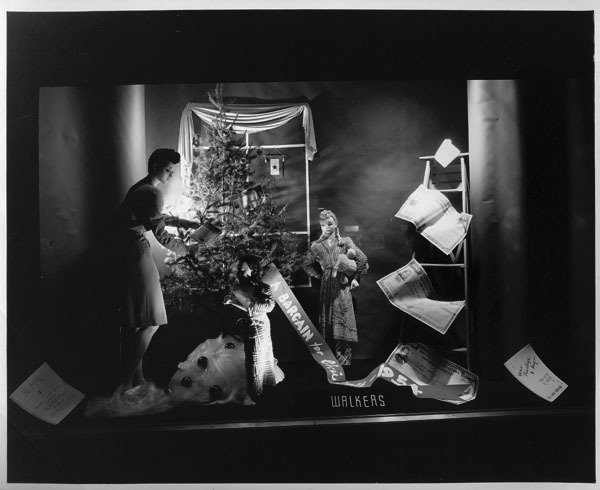 View of display window with mannequins in a simulated home interior. The theme emphasizes purchase of War Bonds. The small banner in the background appears to simulate a “Service Star” that indicated a family member in the Armed Service. Keywords: Business and industry, retail, store, military, Korean War, patriotism. Description: Four different B-47 Stratojet models at Boeing Airplane Company, Wichita Division, used by the United States Air Force. Keywords: Wichita, aviation, business and industry, military, airplanes.